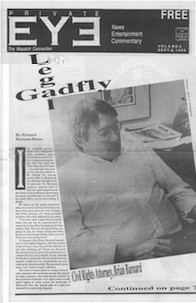 That’s what Brian Barnard came to be known as, a “Legal Gadfly.” That was also the headline for the Richard Barnum-Reece-penned cover story about Brian published in the Sept. 8, 1989, issue of Private Eye—that was our name once. This newspaper began as The Private Eye before changing our name in 1997 to Salt Lake City Weekly. So, I guess I go back a ways with Brian and Richard, both incredibly talented persons, both of whom are now dead. Richard died several years back. Brian died in his sleep a week ago. Both left their imprints on this community and on this newspaper. Both are men lucky enough to have left behind more than a couple of sad songs and memories, as both were able to carve their own lasting legacies while they were alive—Richard with his irascible and fearless writing style that was an early model for many young journalists “back in the day,” and Brian with his gentle and fearless legal style that remains the model for righting the wrongs wrought of constitutional neglect, institutional largesse and impotent leadership. Indeed, they both were gadflies. In recent articles written since Brian died, he’s still described as a gadfly. I wondered to myself how it could possibly be that with all the great victories Brian won in court over these years, he was still considered a gadfly. Methinks someone wasn’t paying attention when given the assignment to write about him. He might have been a gadfly in 1989, but by 2012, he’d long shed his gadfly image and traded his pesky wings in for full-body armament. I remember when Richard dropped off his story on Brian at our old Midvale office. As per his practice, he provided the headline. I took a quick look and asked Richard, “What’s a gadfly?” He looked at me like I was a moron. Do remember, though, that it was Richard who, for a story on a water issue in Bingham Canyon, gave it the headline, “Godzilla of the Oquirrhs” and who once described the Deseret News as “a gob of spit on the face of journalism.” I couldn’t be sure if he was being nice or not. He told me to read it and see if I could figure it out myself. So I began to read. “So, [Brian] sits in a less-than-opulent office above Junior’s Tavern on Fifth South across from the Salt Lake City Library, occasionally looking at the holes in his puke-green, shag carpet and feeling damn good about himself for being the gadfly of Utah’s legal establishment. Brian himself didn’t know what a gadfly was. Yes, he was a large man. Yes, he annoyed the beasts. It was an apt word. Perhaps still so, but when you not only annoy the beasts but slay them also, a more robust descriptor should apply. By 1989, Brian was well on the way to establishing his brand in the Utah market. 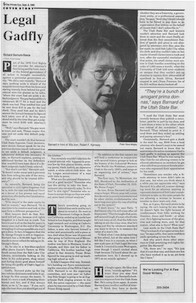 He’d already sued the Utah State Bar 20 times, dedicated hours to civil-rights suits and to labor-rights issues, had just opened the doors of the Alta Club to its first female members and had gotten roughly 75 percent of the state forever hating him with one fell swoop when he successfully litigated against the city of St. George for paying the power bills to illuminate the St. George LDS Temple. Somehow, though, many among that 75 percent came to grudgingly respect, and even like, Brian Barnard, for it’s a funny thing when defending the U.S. Constitution: It’s not long before the nose that was struck by the fist of one issue strikes back at the fists of another. When it comes to civil rights, we all need a Brian Barnard on occasion. A few years ago, Brian asked if we’d be party on a suit against a jail in Logan that was denying inmates certain reading materials—like City Weekly. It may not seem like a big deal to some folks, making certain that the incarcerated might be able to subscribe to and read an issue of City Weekly, but it’s a big deal for us, and it’s a big deal for those inmates. It’s bad enough being locked up for bouncing $20 checks, but to also be denied the chance to read The Ocho? In a word, that’s unconstitutional. Sometime in the 1990s, Brian had asked us to join in another suit—he was suing the state for unfairly regulating the sale and promotion of alcohol. Everyone knew the Olympics were coming and that Utah needed to come of age with its archaic liquor policies and private clubs. We were told by “insiders” that the liquor laws were about to change—the church had approved certain liquor bills that would pass faster than a greased kidney stone during the next legislative session—so we declined. But the good folks at Catalyst Magazine didn’t, and they became a plaintiff in one of the most important rulings on Utah policy in decades. After nearly five years of delayed justice, on July 24, 2001—Pioneer Day, and just months before the 2002 Winter Olympics—the 10th Circuit Court of Appeals in Denver stuck it to Utah and ruled in favor of Brian’s injunction, finally opening the doors to liquor advertising in Utah. A side benefit was that neon signs came back in style. It’s a long tale—but imagine, during our first 17 years in business, that publications, merchants and consumers were denied the protections granted all of us in the First Amendment. Plain and simple, if not for Brian Barnard, there would be no City Weekly. He’s no gadfly in my book—he’s Superfly.